Airbus: Who Needs Real Seats When You Can Straddle Bike Saddles? 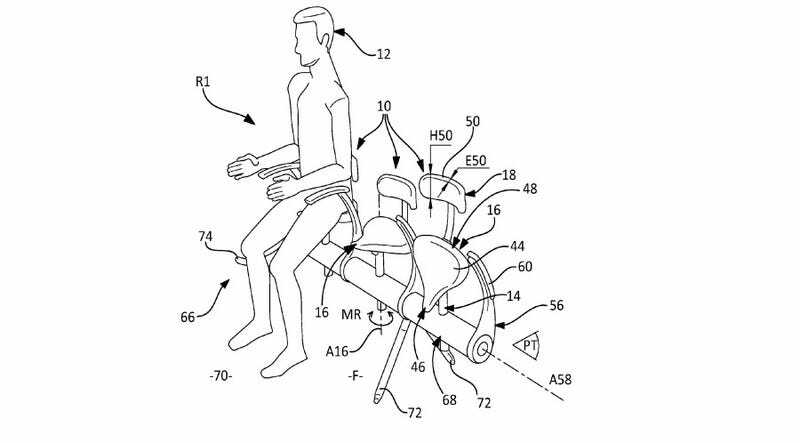 Today in Questionable Airbus Patents, it's not the pilot being displaced; it's our sweet, precious legroom. And about three-quarters of the seats themselves. We just hope you're not a fan of personal space, because otherwise—it's going to be a long flight. In the aeronautical sector, some so-called "low-cost" airlines seek to increase the number of passengers transported on each flight, and more particularly on short-haul links, in order to maximize the return on the use of the aircraft. To that end, and by using the same aircraft or an aircraft of similar capacity, the number of seats in the cabin must be increased. In all cases, this increase in the number of seats is achieved to the detriment of the comfort of the passengers. In effect, to increase the number of cabin seats, the space allotted to each passenger must be reduced. However, this reduced comfort remains tolerable for the passengers in as much as the flight lasts only one or a few hours. In other words: eh, they'll be fine. The upside to all this torture, though, is that it does create the potential for absurdly cheap air travel—if you can take it. Of course, as The Washington Post points out, the new bike saddles on sticks do leave quite a few questions unanswered. Are we just getting rid of tray tables? What about personal carry-on items? Will these pipes save me if the plane goes under? And why are my seat neighbors touching me?